“Evening! Welcome to Ireland,“ said the man behind the counter at Shannon airport, in the Republic of Ireland. I handed him my passport without he asking me for it. “American!” I didn’t understand how that could be surprising in any way. As he flickered through the countless German visas I’ve collected over the past seven years, he asked me where I was going. “Belfast,” I replied. He looked at me and asked “Belfast!? You got friends up in Belfast?” I was still half asleep. “No,” I replied, “not yet, anyway.” The guy was not wearing a uniform and addressed me as “lad.” I didn’t know whether I was talking to a customs officer or just to someone at a pub. He then asked me what my finances were looking like, and I told him I had everything covered. “You work in Germany?” I said yes, he handed me my passport and said “alright. Good man, good man.” I interpreted that exchange as a sign that I would have a good time on the Emerald Isle. Don’t get me wrong, though: There is much more to Belfast than a violent past—such as a great craft beer scene, music venues, and creative young people who look beyond the divide. Likewise, tourism is booming in the capital of Northern Ireland, with thousands going to see the shipyard where the Titanic was built, and thousands more visiting the locations where Game of Thrones is filmed. There is, however, also a large number of curious travelers who flock to the city due to its violent past and, partially, present. Accordingly, a tourism industry catering to these different interests has developed. 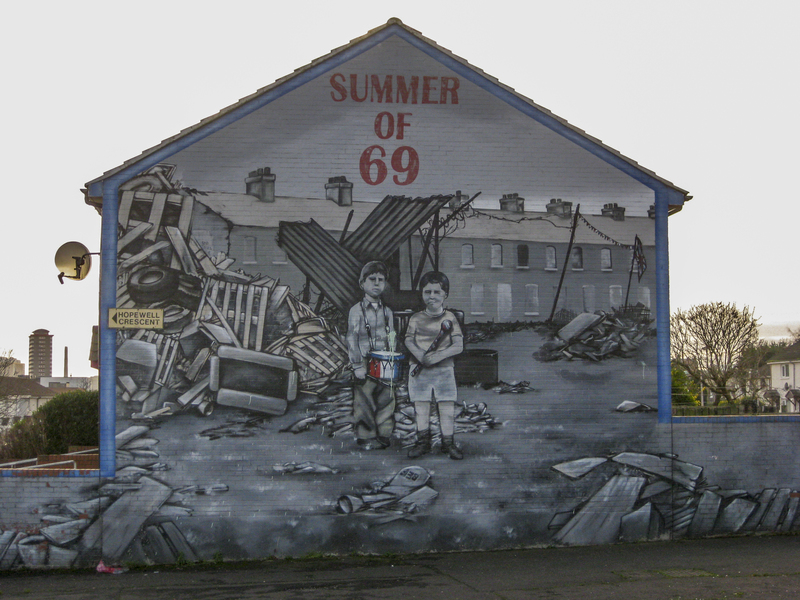 A Loyalist mural close to Crumlin Rd. I belong to that last group of travelers. 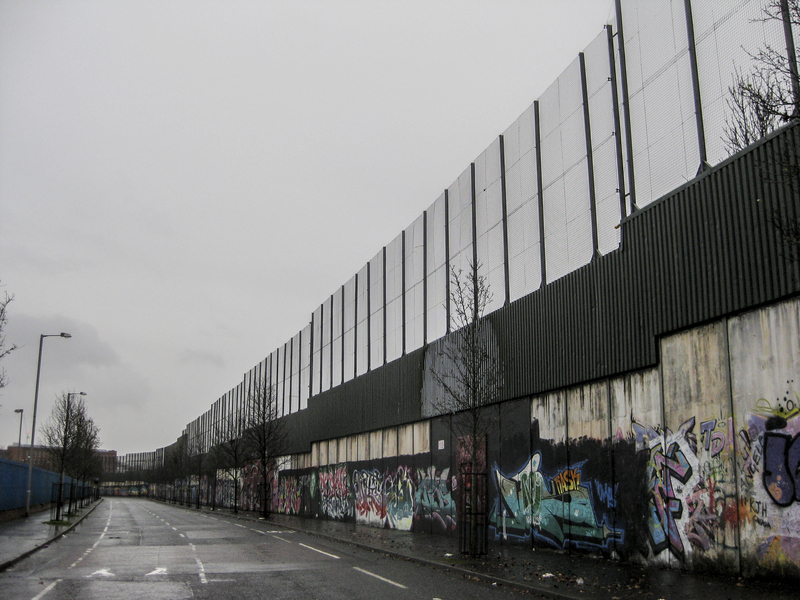 I had read lots about the Irish conflict, and wanted to see and experience Belfast with my own eyes and ears. I had a week off between Christmas and the new year, and figured I would use the opportunity to finally visit the city. Yes, the articles in this series focus on the political aspect alone, which admittedly does Belfast no justice. Belfast is up and coming. 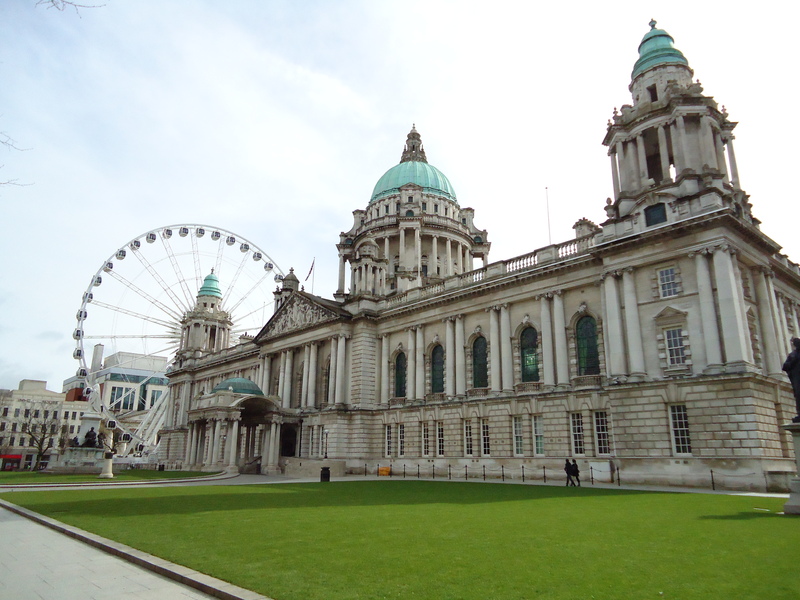 There’s a lot to see and do up there, and in terms of craic (Irish slang for fun), Belfast won’t disappoint you: lots of bars, beautiful girls, and friendly locals all make a stay in the city more than worth your while. “We’re going to send you home fucked” was the warning given to me before really getting the ball rolling at a pub. I wasn’t the one puking outside in the end but that’s another story. 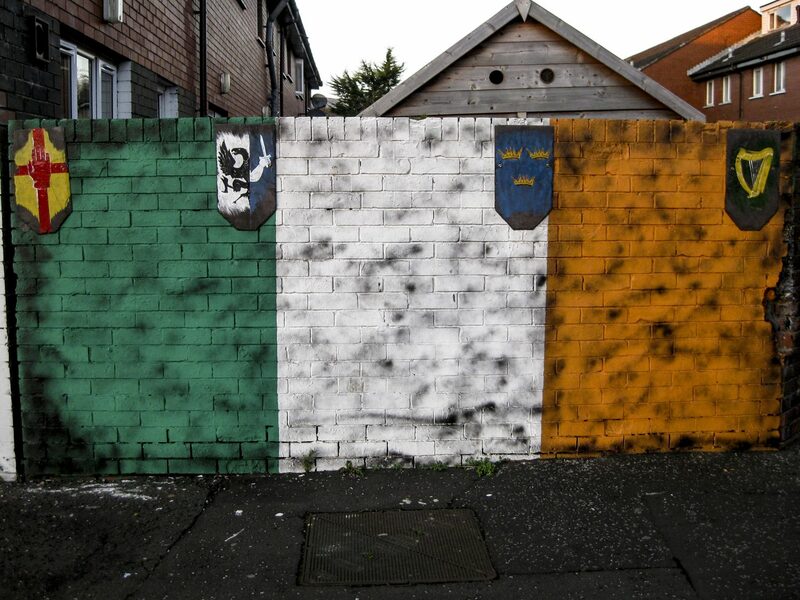 A section of the Peace Wall from the Protestant side of West Belfast. If you’ve never been to Belfast before you might be wondering why there are two Irelands. This short introduction will tell you all you need to know about Northern Ireland and the Irish conflict. All the terms, abbreviations, key moments, et cetera as well as a brief outline of Ireland’s and Northern Ireland’s complex history can be found in the paragraphs below. Basically, this introduction will make the actual articles easier to understand. Northern Ireland is a country that’s part of the United Kingdom and comprises 6 of the 9 counties of Ulster, one of Ireland’s four historic provinces—the other three being Leinster, Munster, and Connacht. The other three provinces make up the sovereign Republic of Ireland—an independent country part of the European Union. 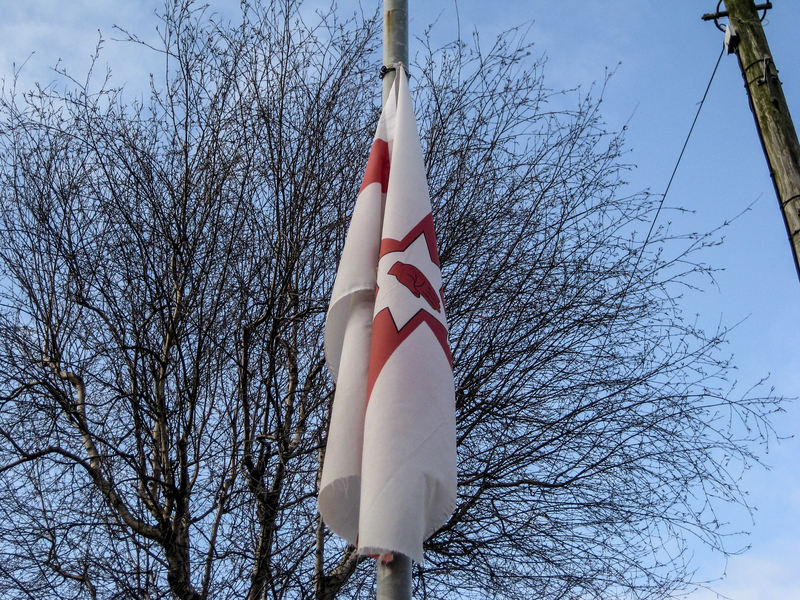 The symbol of Ulster is the Red Hand of Ulster. In the late 1800s and early 1900s, the “Irish Question” occupied a prominent place in the minds of British and Irish politicians: back then, (undivided) Ireland was part of the United Kingdom. Yet the Irish wanted “Home Rule,” or autonomy. The main obstacle here was the fact that the provinces of Ulster had a Protestant majority. 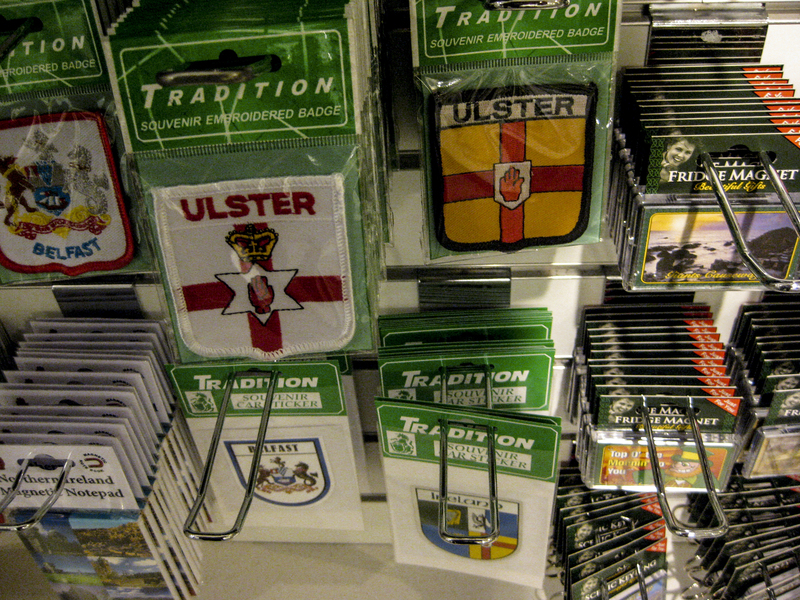 Protestants in Northern Ireland are mostly Ulster Scots—a majority of which are the descendants of Scottish settlers who arrived in Ireland as part of Great Britain’s colonization efforts known as the Plantation of Ulster. Most Protestants in the North were adamantly opposed to Home Rule on an all-Ireland basis and were determined to fight against it should it ever be enacted—however, many Protestants also supported the notion of Home Rule, since this was a question of politics and not of religion. In order to resist Home Rule should it ever be enacted, Ulster Protestants established a militia called Ulster Volunteers in 1912—which was later renamed Ulster Volunteer Force, of UVF. Likewise, the Irish nationalists established their own militia called the Irish Volunteers—which later became the Irish Republican Army, or IRA. 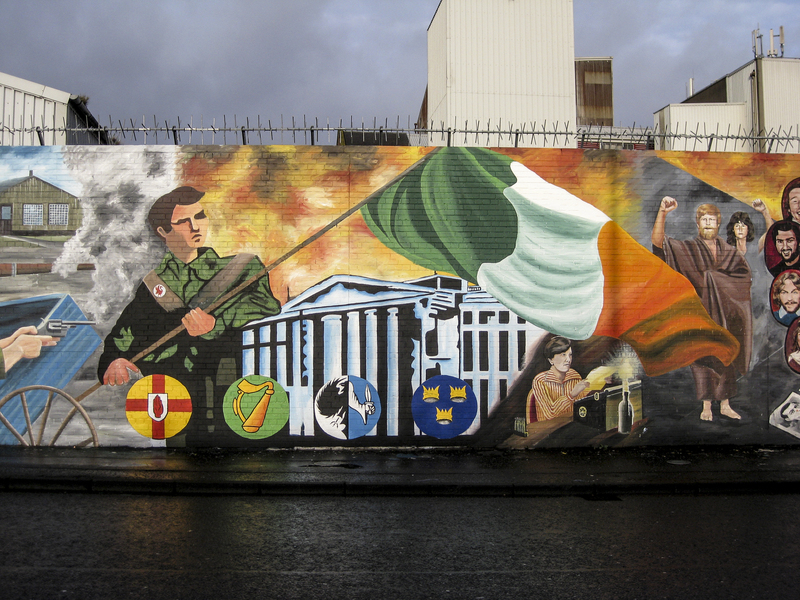 A mural on the Falls Road commemorating the Easter Rising of 1916. The “Revolutionary Period” in Ireland began in the 1910s and saw a shift from Home Rule to Republicanism and demands for full independence—represented by the political party Sinn Féin. Sinn Féin gained enormous success in the elections of 1918, and in 1919 established an independent Irish government and called an Irish Republic into existence. However, Protestant Unionists had won a majority of the votes in many counties in Ulster and were opposed to independence. The Irish Republic laid claim to the whole island, but it had no effective control of the North. London did not recognize the newly declared state, and a guerrilla war between the United Kingdom and the Irish Republic ensued. This conflict was known as the Irish War of Independence, and was waged from 1919 to 1921—ending in a Republican defeat. In 1920, with the Irish War of Independence still raging, the British government decided to enact Home Rule in Ireland with the Government Act of Ireland 1920. Well, in most of Ireland—the six Protestant counties in the North would also be granted Home Rule as a separate entity called Northern Ireland. The Government Act of Ireland 1920 was enacted in April 1921. This act led to the division of Ireland into two entities, both part of the United Kingdom, called Northern Ireland and Southern Ireland. These two entities were to have their own governments and own institutions. 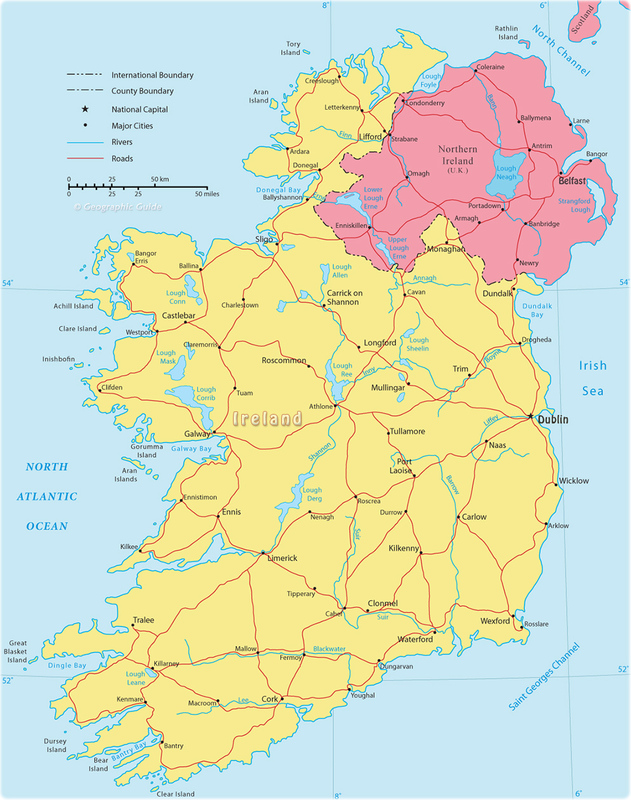 However, Southern Ireland never came into being: The Irish War of Independence was still being fought the South, and only ended in December of 1921 with the Anglo-Irish Treaty, which led to the establishment of the Irish Free State, a self-governing dominion of the crown which would encompass the whole island—if the North wanted to join. The Irish Free State came into being on December 6, 1922. Two days later, on December 8, the parliament of Northern Ireland opted out of the Free State to remain a constituent part of the United Kingdom. The Irish Free State proclaimed itself a Republic in 1937, and effectively left the Commonwealth, thus becoming fully independent, on 18 April, 1949. 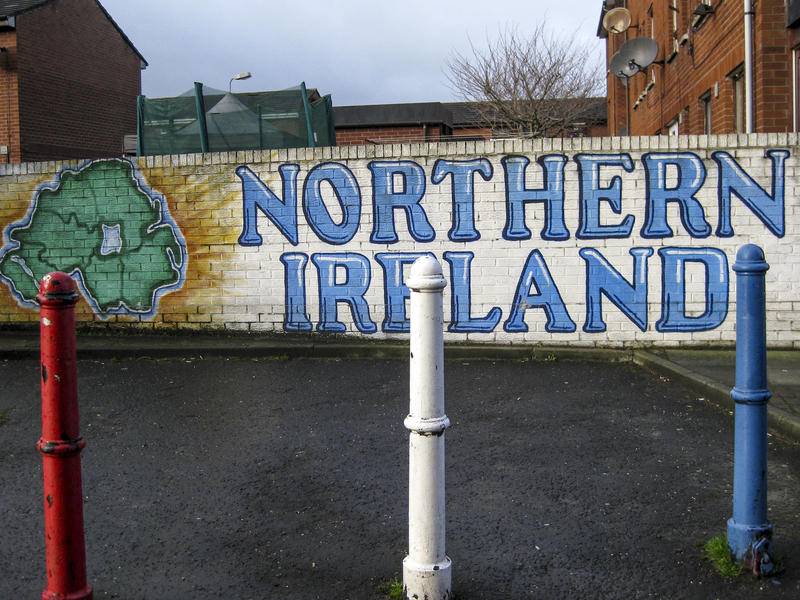 Northern Ireland had a Protestant, Unionist government from its creation until it was abolished in 1972 following an escalation of The Troubles after Bloody Sunday. The Northern Irish parliament was effectively dissolved in 1973, and the country was ruled directly by the British government until a new Northern Irish Assembly was elected in 1998 after the Good Friday Agreement, which officially put an end to the conflict—at least on paper. The fact that the government, the police force, and the institutions of Northern Ireland were controlled by Protestants brought about heavy social inequality. Catholics in the North had already been discriminated against even before Ireland was split. But the struggle went even further back, as in the 19th century the Irish didn’t enjoy the most basic of rights, such as buying land or voting. After all, Ireland was also a country that suffered under colonialism and the oppression that invariably comes with it. 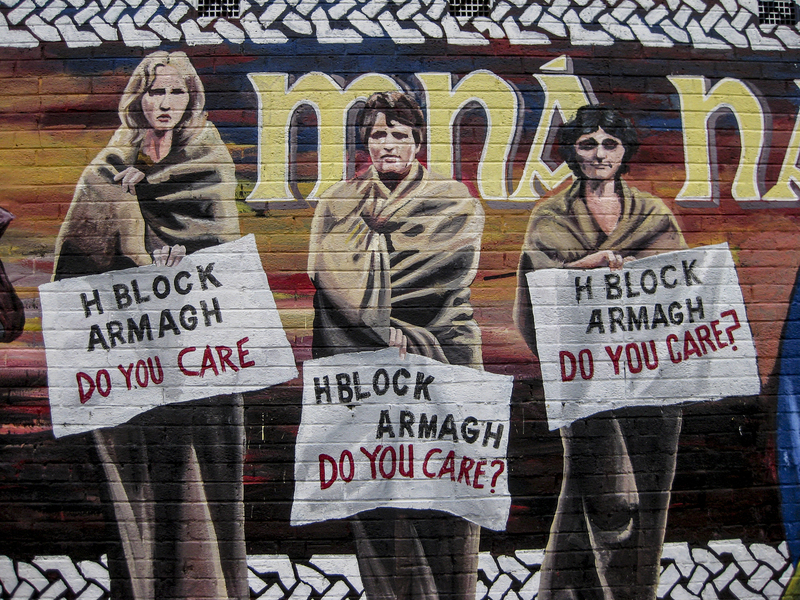 A mural dedicated to female Irish Republican prisoners who took part in the blanket protest that preceded the hunger strike from 1981. Seen in Derry. During the greater part of the 20th century, this social inequality, combined with religious tension and political divergence, led to rioting and open conflict between the Irish Catholic Republicans and both Protestant Loyalists and the Royal Ulster Constabulary (the police force of Northern Ireland until 1998). These conflict escalated in 1969 to such a degree that the British government had to send in its military to try and control the situation. This conflict had been festering and flaring on and off for centuries, but The Troubles (known by many Republicans as “The War”) was the sad high point of it. The Troubles lasted almost three decades, from 1969 to 1998. During those years, over 3500 people died—more than half of them were civilians. 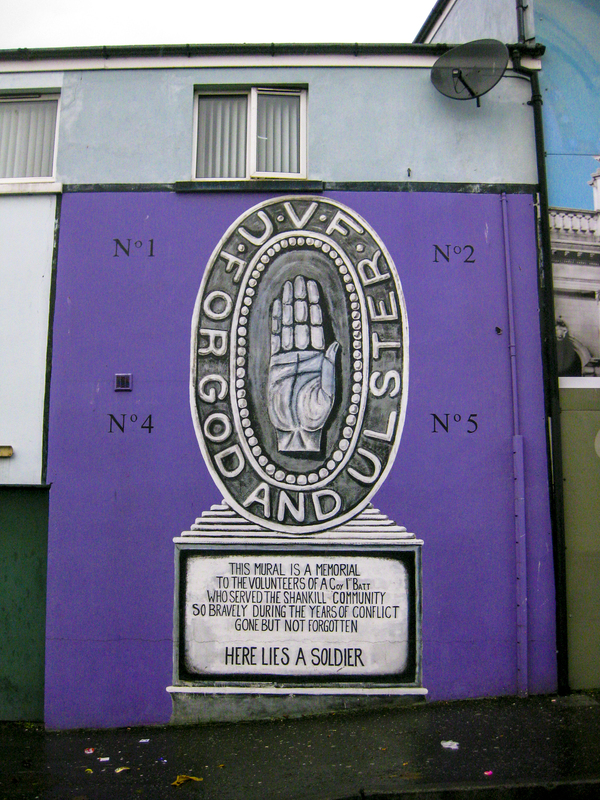 During The Troubles, the IRA and other Republican militant organizations such as the Irish National Liberation Army (INLA) fought against both the British Army and the Royal Ulster Constabulary, but also against several Protestant Loyalist paramilitary organizations such as the Ulster Defense Association (UDA), the Ulster Volunteer Force (UVF), the Ulster Freedom Fighters (UFF), and the Red Hand Commando. 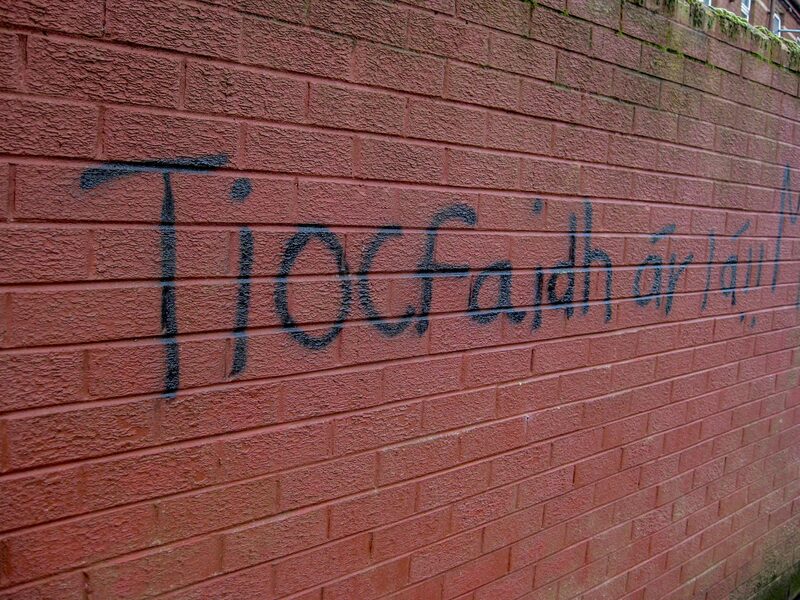 All these groups, Republican and Loyalist, are proscribed as terrorist organizations—and are partially still active today in many parts of Northern Ireland. 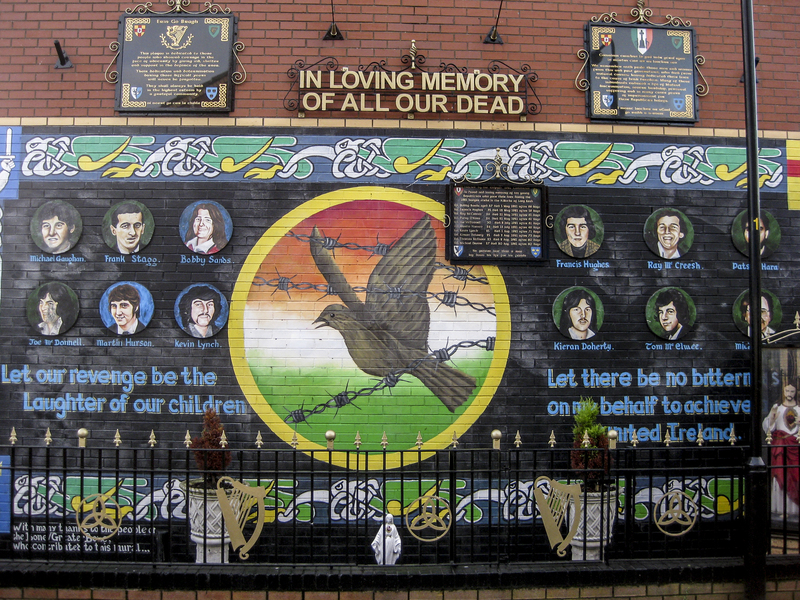 A wall dedicated to the memory of deceased members of the IRA. 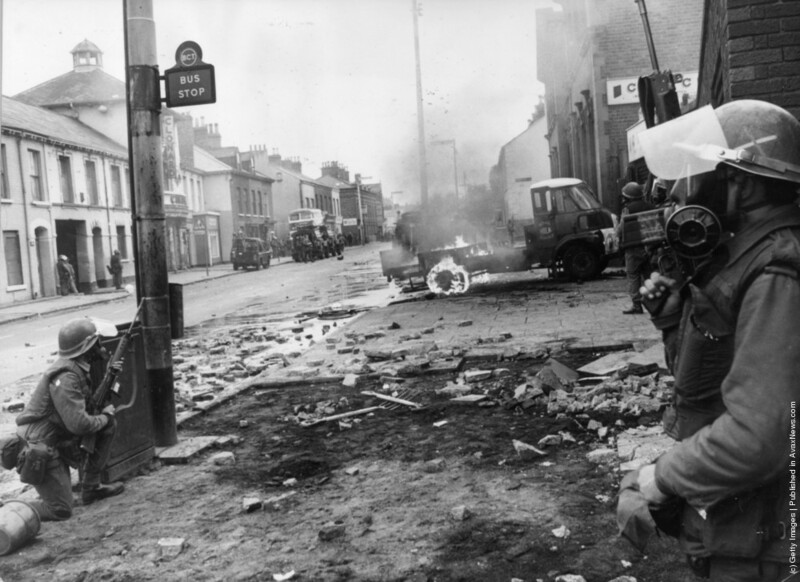 The Troubles saw violence spill onto the Republic of Ireland, Great Britain, and mainland Europe. It also caused a massive movements of population within the country, which is why in today’s Northern Ireland there is so much segregation in residential areas. 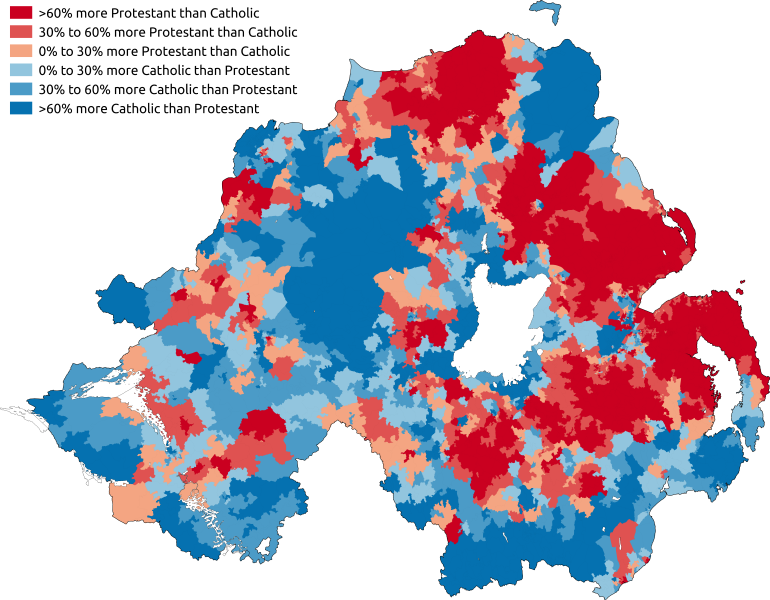 Catholics left Protestant areas, and Protestants did the same. 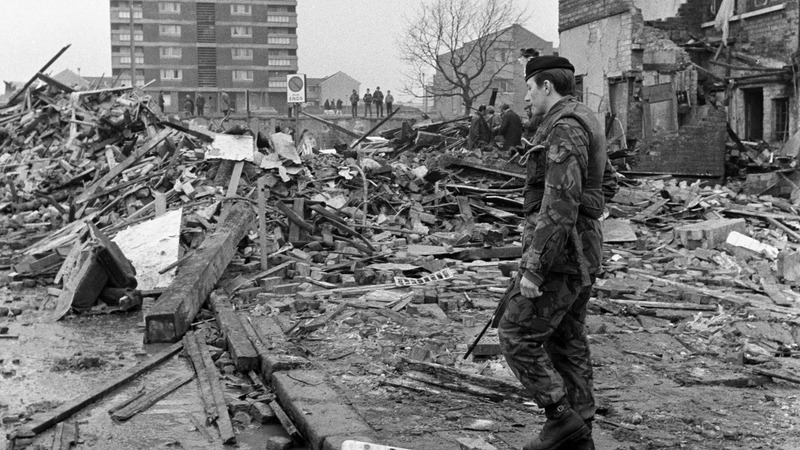 The Troubles were marked by indiscriminate terror campaigns by both Republican and Loyalist paramilitaries that descended into a spiral of vengeance against civilians. Snipers, executions, and bombs were all common back then. Northern Ireland devolved into a war zone. The aftermath of the McGurk’s bombing. The Protestant Loyalist UVF detonated a bomb at a bar, killing 15 civilians and wounding 17 more in the deadliest attack in Belfast during the whole conflict. 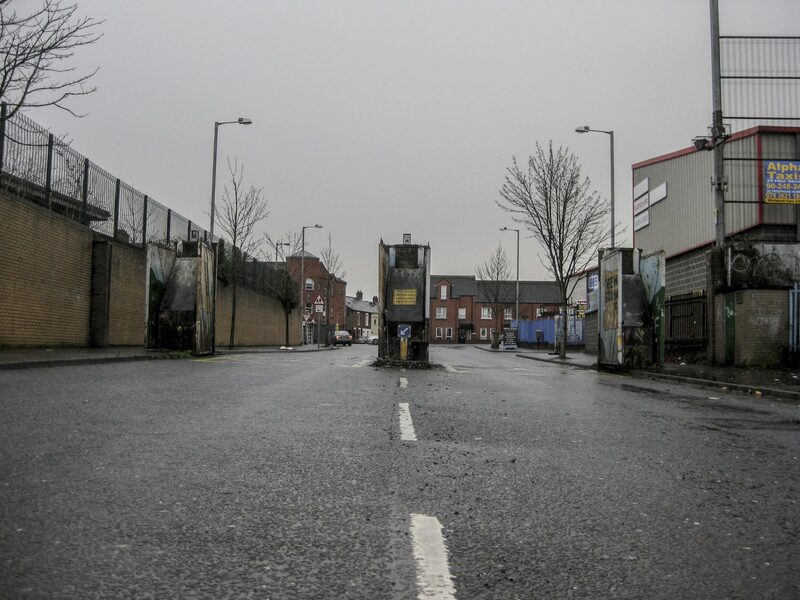 There’s a tendency to over-simplify the conflict in Northern Ireland. It’s not simply “Catholics against Protestants.” It is a political conflict with religious and ethnic aspects that has been going on for centuries. Worth pointing out here is that some of the earliest proponents of Irish Republicanism were Protestant. “My wife’s Protestant, and she’s more Republican than I am,” told me a friend in Belfast. For Republicans, the ultimate objective is reunification with Ireland—for Loyalists, remaining as part of the United Kingdom. Things have changed in Northern Ireland. There are neither check points on the streets nor British soldiers on patrol anymore. Also, some of the more aggressive and militant murals have been painted over. However, The Troubles lasted officially from 1969 to 1998—that’s almost three decades. There has been peace in Northern Ireland for less than two decades now, and the conflict is still present in Northern Ireland: Murals commemorating former paramilitary leaders, symbols of paramilitary units, fortified police stations that look like castles surrounded by metal cages, police cars that look straight out of Mad Max, and walls separating Republican and Loyalist areas—within Belfast alone, the “Peace Wall” has a combined length of over forty kilometers. And the Peace Wall has only gotten higher. The upper part of the wall, a steel grid, was only installed in 2005. The British Army only finished “Operation Banner” in 2007. Today, there is peace in Northern Ireland, though isolated paroxysms of violence still flare up from time to time. Map from 2011. Taken from Wikipedia. 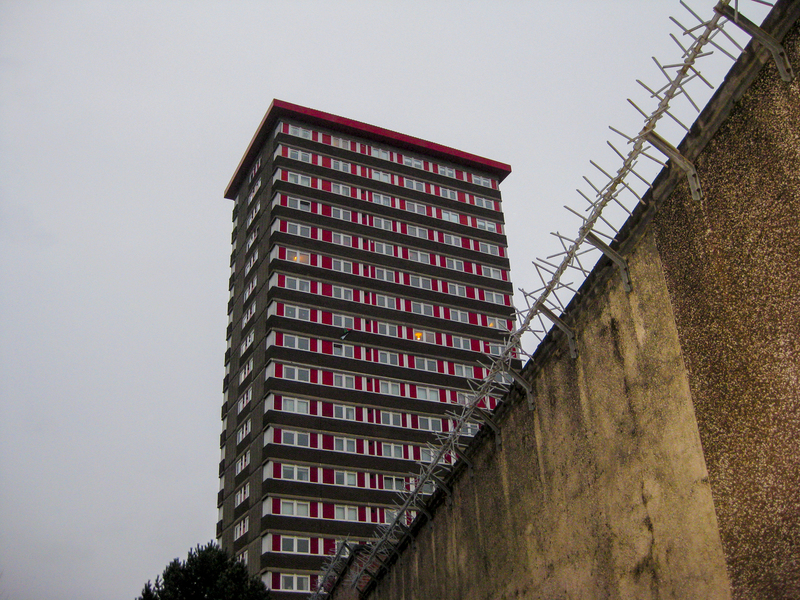 The top two floors of the Divis Tower were used as an observation post by the British Army until 2005. The observation post could only be accessed by helicopter. 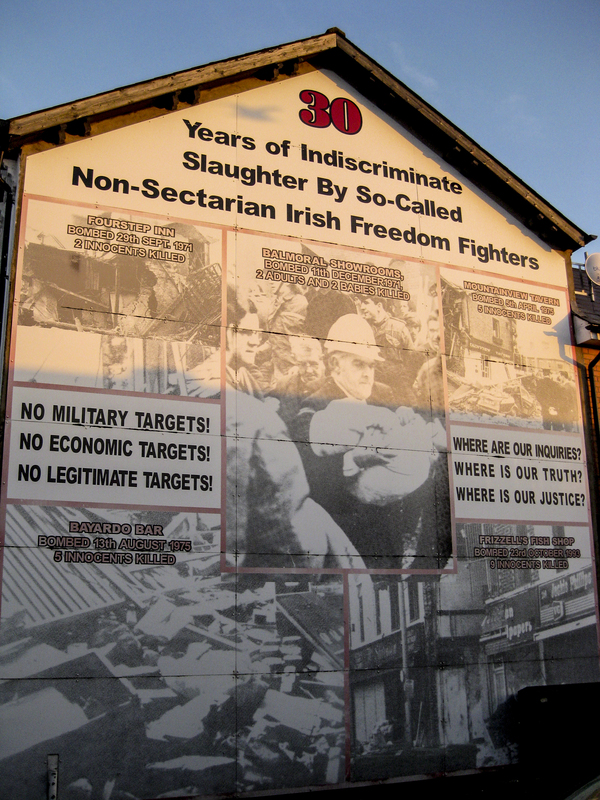 A mural on Sandy Row, a Loyalist Protestant area of South Belfast. 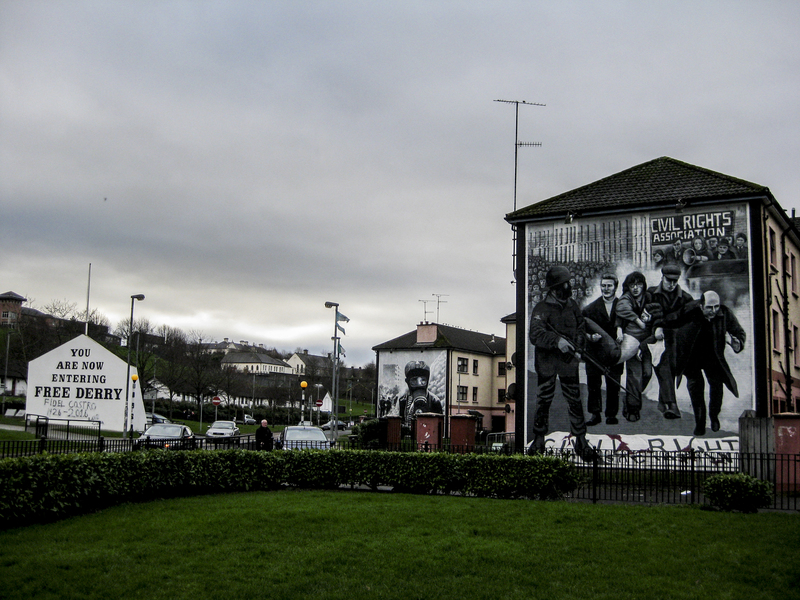 I went to Belfast and Derry to see and hear for myself what it’s like there today. I read about the country and read the news everyday before going, and researched where to go. I spent a total of a week walking about through inner-city areas and drinking in pubs with locals to try to take in as much as possible from a neutral perspective, and this series is the product of that. Hope you enjoy it! By the way, please don’t forget to like my page on Facebook and follow me on Instagram to help Between Distances grow! Next installment: A tale of two cities. Disclaimer: I do hold a graduate degree in history, but Between Distances is still a travel blog. However informed and well-researched, this is not an academic essay. I really enjoy your take and looking forward to the next installment. My grandparents were Protestant and Irish Catholic, which seems like a pretty meaningless distinction for our generation at this point – it wasn’t a sticking point for them either – so it’s illuminating to have a window into places where these traditions have a deep and daily impact. These kind of social breakdowns have an impact on the physical space of the city, similar to what you find in other countries where fearful neighbors have put up walls and fences against intruders. Tearing down these walls is as much psychological as it is physical. This reminds me of a cab driver that I met on visiting Malta that told us he goes to church in the morning and in the evening, every day. That is a lot of Catholicism! It was beyond my comprehension that someone could be that devoted to a belief to follow it not only weekly or daily, but twice a day. It’s a small place, and it feels very isolated, but it reminds you that these traditions can be cultural, geographic and very ingrained, regardless of our jet-setting travel and work habits. Glad you liked the article. Thanks for taking the time to read it! Yeah, absolutely. And it gets even more complicated since religion is just an aspect of the conflict, which is primarily political. There are also Protestant Republicans, and some of the first to fight for the rights of Irish Catholics back in the 18th century were Presbyterians (See: United Irishmen). Interestingly enough, the Irish Tricolor is supposed to symbolize peace (white) between Catholics (green) and Protestants (orange). Fascinating read and I can’t wait for the next installment. Thanks a lot! Glad you enjoyed the read! Nope, I got a cooler patch at the Cliftonville match (check my rhymez, yo). Anyway, glad you enjoyed the article. Thanks for reading! This second part reinforces my view that you have put the cart before the horse and while you broaden out your analysis to say it is political it still doesn’t give any real idea that the most malign force in our history was and is the British and the result of their colonial rule was played out in the North in an armed conflict with Britain deploying the biggest army, using coercive legislation but more to the point arming the unionist death squads and deploying them as part of their war machine. I accept you are trying to make sense of an unfamiliar history but it seems to me your ‘sources’ derive mostly from an establishment perspective. I see what you’re saying and appreciate where you’re coming from, Peadar. Thing is: Between Distances is still a travel blog and not an academic journal. This article just presents an outline of the context to go with my travel experiences—which is still what my blog is all about. You’ve raised good points though and I’ll make sure to pay attention to them in my later posts. Like I said, this is just the second out of seven pieces. Very good work done ,you did get a lot of what happened years and years ago .But the snaps were class . Cheers Patrick, glad you enjoyed the read! Thanks for your interest. Excellent depiction of a city I now want to visit more than ever. Nice melange of present day observations and historical context. Cheers, man. Thanks for checking out the article. Glad you enjoyed it!